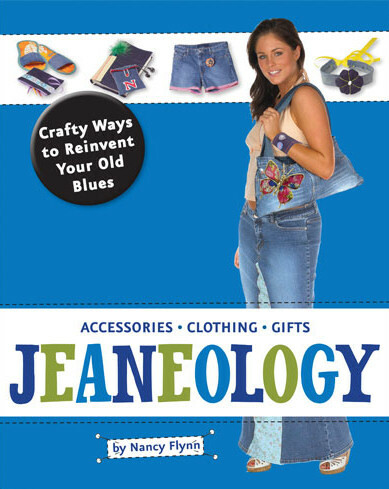 Jeaneology by Nancy Flynn is written for teens and has projects for recycling torn or old jeans into new things. Since my teenage daughter is a big fan of upcycling and sewing, it seemed like something she would enjoy. I was right. It's written at a close to beginners level. The author does assume at least basic hand sewing skills, and that was my first very pleasant surprise about this book. We have a lot of sewing books, but most modern books focus strongly on machine sewing. They never seem to take into account young sewers like my daughter who can use a sewing machine but honestly prefers to sew by hand. The instructions are written so they can be used by both hand sewers and machine sewers. The beginning section includes useful information like explaining about bias tape and other tools you may need and how to pick the right hand sewing or machine sewing needles for working with denim. The layout is image heavy with clear illustrations, and spiral bound with a heavy paper cover so it can lie flat. There is a full color photo of every project, and interspersed throughout the book are trivia, facts and tips about jeans. This was one of my daughter's favorite parts of the book. The projects are well organized, starting with clothing in a chapter called Rocking Rags. Converting jeans into a maxi skirt or a mini skirt, making shorts and a great set of tips for distressing or customizing an existing pair of jeans. I absolutely loved the photo of the star stenciled jeans that were discharged using a bleach pen. Mean Jean Accessories has headbands, gadget pockets and the nice big purse that's pictured on the cover as well as some great casual jewelry projects for making the most of even small scraps. This was my favorite chapter because it's a good way to use jeans your family gives you that are torn or stained. Blues You Can Use has gift ideas and projects that are functional. This chapter had my daughter's favorite project, an oven mitt. It also has projects like coasters, place mats and a cute little key fob. 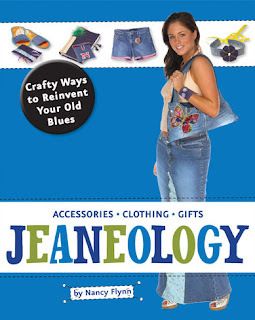 As a crafter, I love the ideas in this book for upcycling and using jeans. My daughter loved it just as much. The projects are a good mix of things to do with whole intact pairs of jeans and pairs that have seen better days. 25 projects total, all very well illustrated with good text instructions. Published by Zest Books - Teen Reads with a Twist.